STOP HS2 | Could Tories Drop HS2? The General Election may provide a final chance to get HS2 cancelled, as whilst Ministers have denied there has been a policy change, it has been reported the Conservatives are considering scrapping it in their upcoming manifesto. Whilst the Guardian speculated, news broke at the weekend in the Sun and the Express that the party were considering that HS2 might be paused or cancelled, with some editors deciding that this would be to ‘pay for Brexit’ due to leaving the EU meaning the project would cost an extra £10bn. Of course the the reality is the likely increases beyond the official £56bn cost would be more than that with or without Brexit. It’s known that Theresa May had wanted to cancel HS2 when she first took office but was told it was ‘too late’, despite of course the fact that whilst £2bn has been spent on HS2, £7bn had been spent on the NHS computer system when that was cancelled, and May herself cancelled projects that had burned millions when she first arrived in the Home Office. 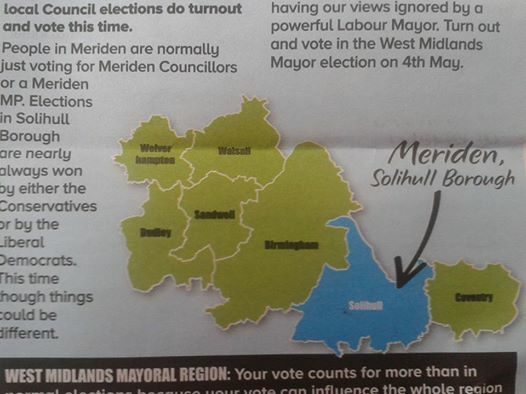 Andy Street produces a map showing the Meriden constituency for those who don’t know where it is, such as Andy Streets’ campaign team. 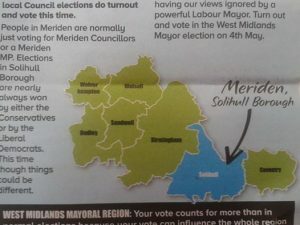 This was rather an odd statement from Street as yesterday his election leaflets hit doorsteps, headlining with his stance to protect the Meriden Gap Green Belt, though for some reason his campaign team seemed to think this would be the most important issue in the neighbouring Kenilworth & Southam constituency where those leaflets where delivered. For someone supposedly so concerned about the green belt, you might expect him to notice that the biggest threat to it, whether that be in either the Meriden or the Kenilworth & Southam constituencies, is of course HS2. Less emphatic in his defence was Communities Minister Andrew Percy, who when asked about HS2 in the House of Commons responded, saying that there was no change in the government’s policy before changing the subject to extol in detail other rail projects in the North of England. The thing is, his phrase that there is ‘no change in Government policy’ helps explain the situation far better, because purdah due to the upcoming election started last weekend. The fact purdah has already started means there can be no changes to Government policy. The Conservative manifesto is a completely different matter and Conservative Home are running a survey on it here. And that’s the real issue at hand, the speculation that the Tories are rethinking HS2 isn’t really speculation, it came right from the Prime Minister’s policy chief George Freeman MP. So far from this being speculation due to ‘manifesto silly season’ as Andy Street suggested, the source of the story is a man who will have more than a little say in drawing up that manifesto, which is expected in the middle of May. The reality is that there has been massive discord about HS2 within the Tory Party, the Treasury certainly don’t want it, everyone knows the costs will continue to spiral with the CH2M scandal showing contractors have far too much influence in where the final cost will end up, and of course those now in power have seen the ugly details of the reports from the IPA (formerly MPA) and Sir Jeremy Heywood. With public opinion consistently coming in against HS2, cancelling it, unlike statements already made to suggest tax increases, would actually be a vote winner, something which former HS2 dissenter Jeremy Corbyn might also want to bear in mind. It very much seems like the last chance saloon is reopen for business.